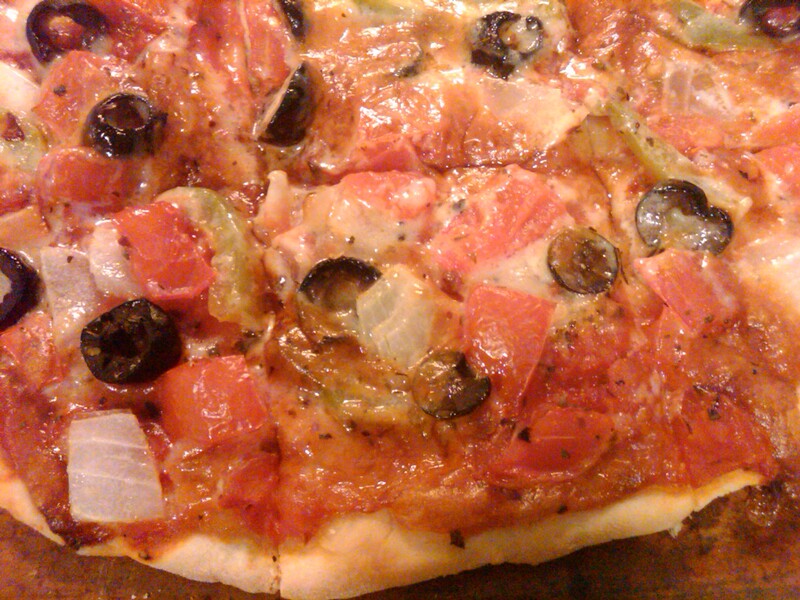 The crust for St. Louis pizza is thin and crispy, which means the crust doesn’t have to rise. Yippee! Not that I mind letting a crust rise, but it definitely makes for a quick dinner. First, I activated my yeast (if you have instant, you don’t have to do this), which means I used a little tiny bit of sugar. Then I mixed the activated yeast with the rest of the water. After that, add half the flour and salt and mixed. Then add the oil. 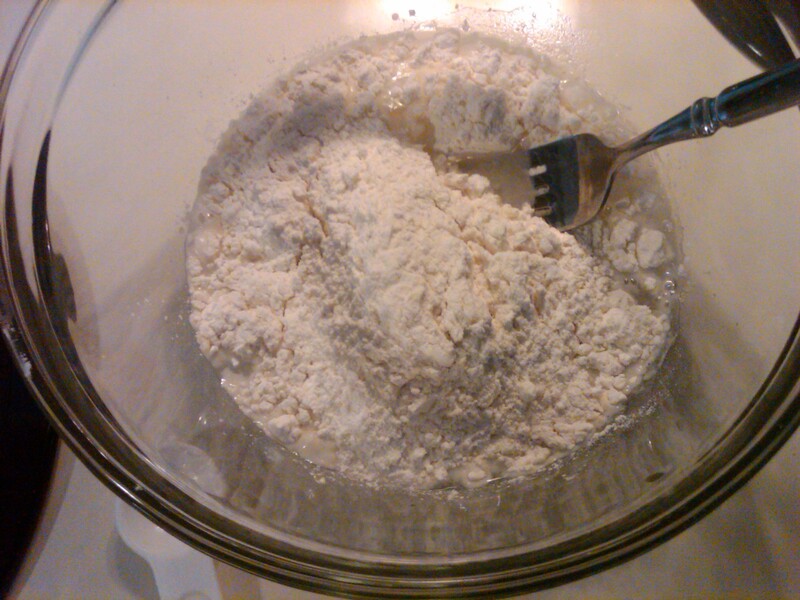 Then the remaining flour. You could use a stand mixer, but trust me, this was easy to mix. Then I threw it on the counter and kneaded it a little. Don’t let the dough rise. In fact, if you do it will compromise the outcome of the crust. Spread the dough thin, to about 12 inches in diameter. I used a rolling pin and my hands to stretch. Then it says to place on a pizza stone and bake at 450 degrees. 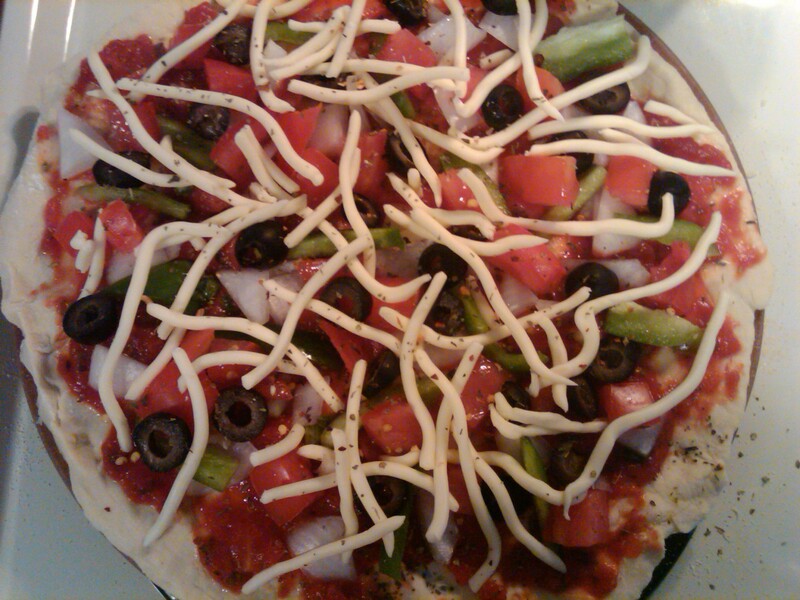 I wasn’t sure if you were actually supposed to bake the crust PRIOR to adding toppings (and then bake again). But I think you are. I’m not sure how long to bake because it doesn’t say. But I would say bake it until the crust becomes light golden brown. It also doesn’t say whether to pre-heat the stone, but I always pre-heat mine when I pre-head the oven. Anyway, I DIDN’T pre-cook my crust, but next time I will because I had a hard time getting the crust to cook without burning my toppings. This makes enough sauce for one pizza. But you could easily multiply it by 4 to use the entire can of diced tomatoes and tomato paste. I’m sure you could freeze this sauce, but that’s not really my style. In fact, I’m not sure I have a style? All you do is mix these ingredients together. 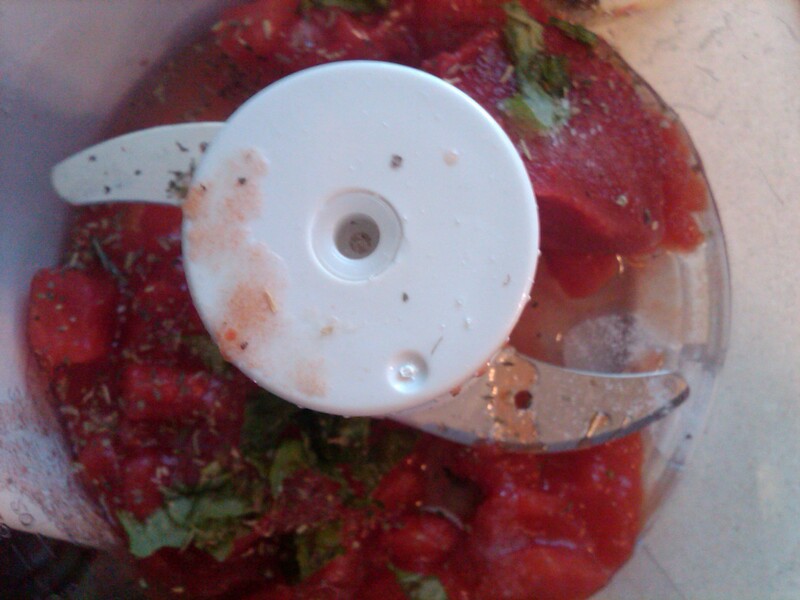 I ended up blending them in a food processor to make a smoother sauce, but you can do chunky, too. Toss until cheeses and smoke flavoring are completely incorporated. 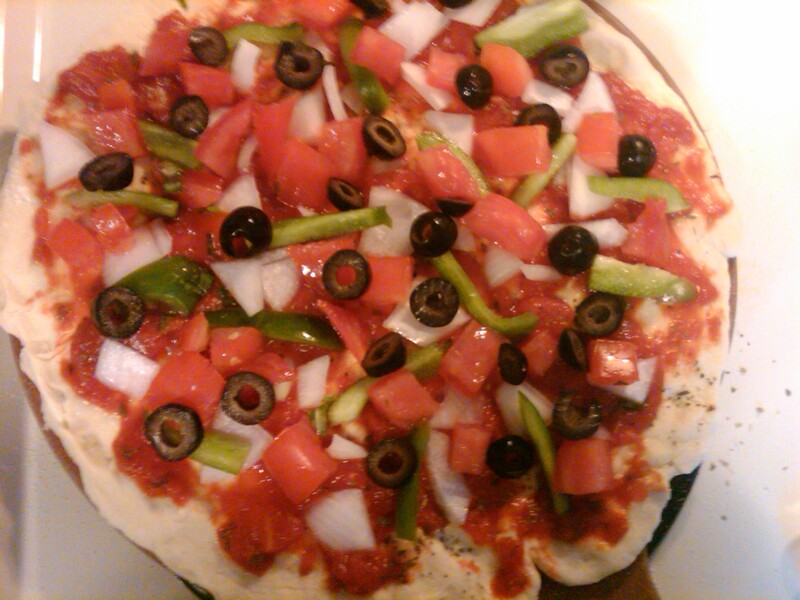 I don’t know why but the recipe I found listed “typical” St. Louis pizza toppings. I say use whatever you want. 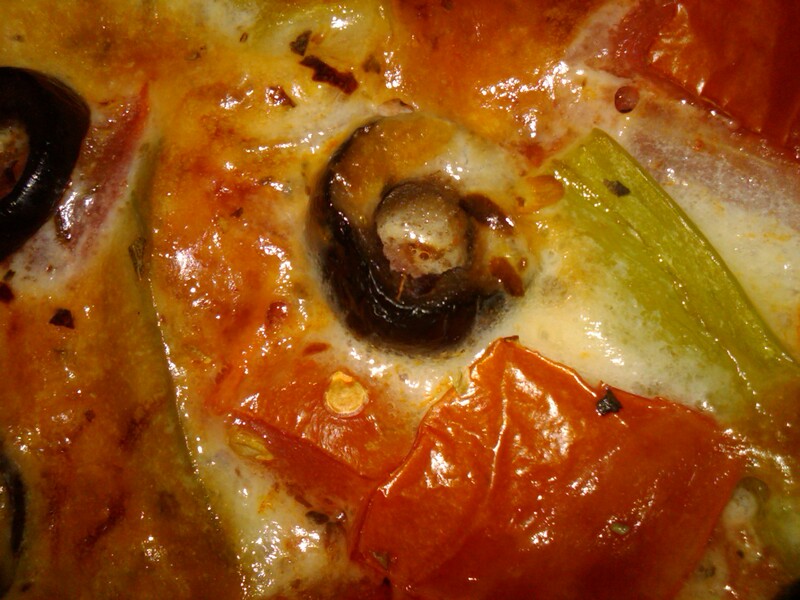 But for the sake of being typical, here are suggestions: Extra-Cheese, Onion, Green Pepper, Sausage, Hamburger, Pepperoni, Anchovy, Bacon, Black Olive, Mushroom, Canadian Bacon, Jalapenos, Pineapple, Banana Peppers, and Tomatoes. After you’ve cooked the plain crust to a light golden brown, add the sauce then your toppings of choice, and sprinkle with cheese. Then top with oregano, basil and thyme. Or if you’re me, sprinkle with more Italian seasonings. Put back in a 450 degree oven and cook until the cheese is slightly golden brown (mine overcooked because I didn’t precook my crust), and the bottom of the crust is dark golden brown. Even though my crust was under-baked it was still good, but I definitely over-baked the toppings to get it to where it was close. The toppings didn’t taste bad, just a little mushy. So that’s why I say I’d pre-cook the crust next time. And the true test was I actually liked the cold/leftover pizza. Which rarely happens with other crusts I’ve used! Oh, and for true St. Louis pizza, cut into squares. And enjoy! Sauce ingredients, ready to be mixed with the food processor. 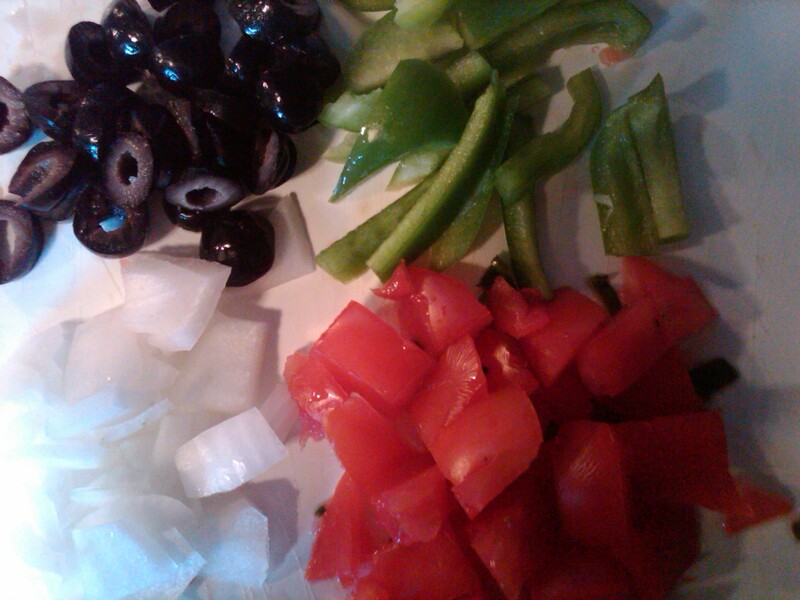 I only used black olives, green peppers, onions and tomatoes because I didn’t want to get out in the heat and buy meat. Trust me, I was craving Italian sausage, pepperoni or ground beef, though. Next time, meat is a MUST! 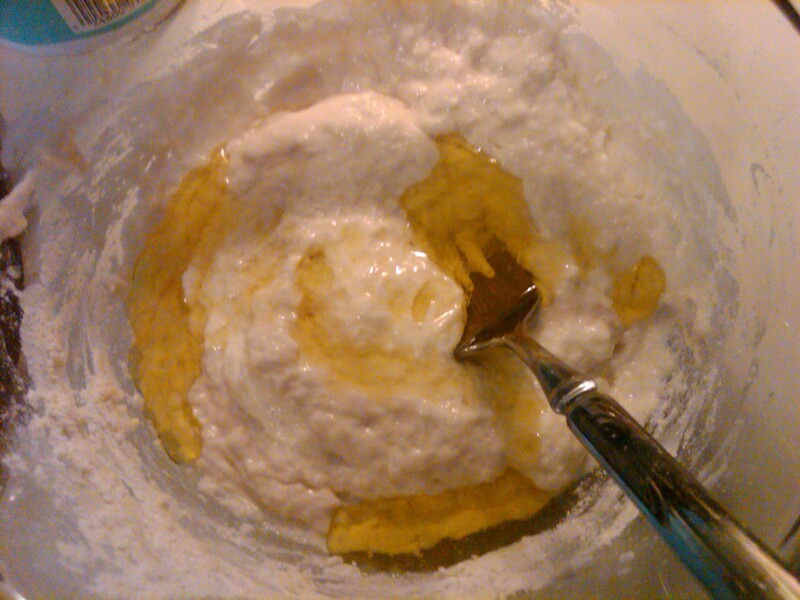 I mixed the salt and flour by hand, then stirred in the water/yeast mixture. Then you stir in the oil, and add the last cup of flour. 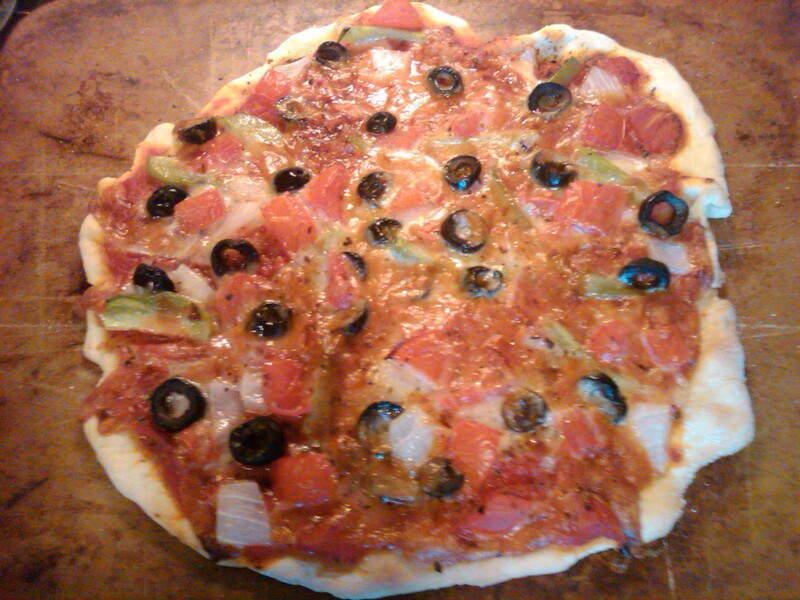 Here is the sauced pizza, covered with toppings. My Provel cheese came in ropes, but it melted up fine. If you make the cheese by hand it’ll probably be shredded. You can probably also buy shredded Provel. You also can’t probably see, but I’ve added a shake of Italian seasonings on top of the toppings. Here’s my pizza fresh out of the oven. YUM! The toppings are a little more done than I’d like. But I had a hard time getting the crust done. This is why I assume I needed to pre-bake the crust. Still looks delicious, no? It was! Mmmmm. Sure does look delicious. The crust seems super easy, I’m totally trying this next time I make pizza. But, I’ll be sure to add meat to mine. Make sure to pre-cook the crust! Oh my gosh that looks sooooo yum! I can’t wait to try it again, pre-cooking the crust. The sauce was really good. If you like sweeter sauces, it was really easy to make. And Kendra’s right, the crust is super-easy, especially compared to rising crusts. So overall, a win. And I was surprised I liked Provel cheese so much.